Body Transformation: Trimmed Down Timmy! Timmy initially transformed to impress a girl, but was intoxicated by euphoric endorphins. See how a gym addition helped him lose 90 pounds and 20 percent body fat! People always ask why I decided to transform and it's hard to give a simple response because it was a combination of many aspects. The initial reason was to get a girl in high school to notice me. I was 250 pounds and she was gorgeous. If you do the math, I had no chance. I sound very critical, but she was the reason I started my journey. You live in a different world when you're overweight. I never got bullied or made fun of, but felt excluded from social events because of my size. I don't know how to explain it on a scientific level, but I was treated differently after my transformation, which was good and bad. I got compliments and attention, and I'm thankful for it, but it took a transformation for people to notice and talk to me. These times show who your real friends are. My character remained the same, but I looked different. It was a tough journey and I learned lots. I grew physically and mentally on many levels. Throughout the transformation, my initial reason to change disappeared; I wanted to be healthier. Before my transformation, I was very insecure. I was outgoing, but lacked confidence. I was afraid to be myself around people. In high school, I felt like everyone was having the best years of their lives while I sat back and envied them. You get treated differently for being overweight and I was tired of it. The difference after my transformation was night and day. I felt energized. I became more organized and was ready for any task or job. I became addicted to going to the gym. It's a great feeling when people say you're an inspiration. That's when you know you're doing something right. I couldn't have done it without my best friend, Tu Nguyen. He's been spotting and motivating me since day one. Starting this journey was the best decision of my life. My life is still the same, except I don't sit around and eat junk food. I spend lots of time in the gym and with friends and family. I research new workouts to keep my body guessing. I started training some of my close friends and really enjoy it. I get questions from random people at the gym who ask bodybuilding-related questions. It feels good to help people who want to start a journey and reach their goals. I knew what I wanted and what I had to do to get there. Knowledge played a key role in my success. I did hours of research on workouts and nutrition. 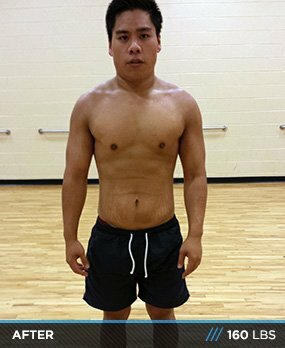 I used Bodybuilding.com for exercise videos that demonstrated proper form and incorporated what I learned in the gym. The more you know the more you're prepared to conquer a challenge. I'm an endomorph and struggle with body fat, so I used a six-day split workout program that consisted of two muscle groups per day, and most importantly, 30-second rests between sets. The workouts sent my heart rate into the fat-burning zone and helped me build muscle. There were days when I hated myself (particularly my body). I was negative and disgusted with what I became. I wanted to give up after week one and two, but believed in the process. It's hard to keep going when you don't see immediate results. It takes patience. I did lots of self-motivating that worked when I had little support. I still self-motivate in all aspects of life. I took two years to focus on what I wanted most. After the first rough year, everything changed. 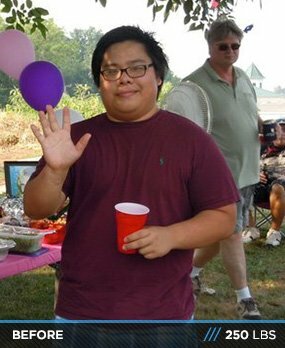 My friends and family noticed my dramatic weight loss, which motivated me to keep going. From that moment, it got better. Apply Here To Be A Transformation Off The Week! I take 30 seconds of rest between sets and do light cardio for 15-30 minutes after every training session. I do abs every other day. Diet portions and cardio sessions tried me the most. I thought if I worked out I could eat whatever I wanted, which didn't work. This leads to small decreases in body weight, but few muscle gains. You can actually gain weight through fat if you're not careful. I hated the cardio sessions because they were boring and tough on my body. I got stronger, but was still chubby in most areas. I didn't want my hard work to be wasted, so I stayed disciplined on my diet and implemented cardio sessions throughout the week. I want to stay healthy and train consistently. I want to improve in all aspects of my training. Most importantly, I want to help and inspire people to reach their fitness goals. In the end, it's about what you truly want. Your journey starts when you create goals. Knowledge is power. Do your homework and research before you start. Stay away from negativity unless you use it as motivation. Patience pays off. For current transformers, keep going! The articles helped immensely to get different perspectives and craft my workout routine. Bodybuilding.com has consistent and new information that helps you achieve your fitness goals. 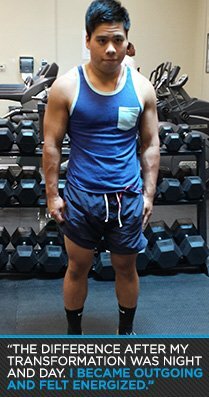 My favorite aspect of Bodybuilding.com is the in-depth workout videos.